Malaysia is truly a foodie’s paradise. We are blessed to have food cultures all from all over the world converging here. And we’re even more blessed that Malaysia has evolved a truly fusion cuisine because of our different cultures intermingling.This cuisine evolved along the law of the jungle – where the best recipes survived and thrived and the junk recipes died out. So we got the best of the best!We can easily get authentic Chinese food here. But then again, a lot of our so-called “Chinese” food is influenced by cooking styles of other communities. Most of them evolved in the streets and kitchens of Malaysian Chinese communities and have become a uniquely Malaysian culinary heritage. Take curry mee for example. This dish is so normal to Malaysian Chinese that it rarely crosses our minds that curry is not a Chinese dish. Yet, it is also a uniquely Malaysian Chinese food because curry mee is unknown to Chinese communities in other parts of the world. But there are also many Malaysian Chinese dishes that are very popular in here but are almost unheard of in Chinese communities around the world. Here are 6 of the most popular Malaysian Chinese foods that were created right here in Malaysia. This popular dish is only served during Chinese New Year. Consisting of slices of raw fish, shredded vegetables, sauces, spices and other condiments, the dish symbolises good luck, prosperity and abundance for the year ahead. Everyone at the table tosses the colourful yee sang with their chopsticks while shouting auspicious wishes. While yee sang traces its roots back to China, the modern version of yee sang (and the way it is served and eaten) is very different from the original and is completely Malaysian. Several people have claimed to be the inventors of modern yee sang, but the most believable claim is by the Loke family from Seremban. Loke Ching Kee (who is incidentally the grandfather of Rasah MP Anthony Loke) had a thriving canopy rental business in the 1940s. But every Chinese New Year, Loke would host a giant dinner and serve platters of yee sang to Seremban folks. The entire street fronting his shop would be filled with people and they would do the lou yee sang. Today, yee sang is synonymous with Chinese New Year in Malaysia but almost unheard of in Chinese communities around the world. Although heong peng traces its ancestry to China, its taste and recipe is very different from traditional pastries from China. Malaysian heong peng (which literally translates to “fragrant biscuits”) is a round biscuit filled with a sticky filling that’s sweet yet slightly savoury and topped with sesame seeds for extra fragrance. Heong peng is one of Ipoh’s most famous foods, alongside bean sprouts chicken and white coffee. This humble pastry has an incredible following, with busloads of tourists arriving almost daily to the Gunung Rapat area of Ipoh just to get an authentic taste. Outstation fans don’t mind driving hundreds of km to buy the biscuits, sometimes taking dozens of packets at a time. And while Ipoh’s Yee Hup brand of heong peng is famous worldwide (it’s exported to 18 major cities worldwide, including New York, Paris, Hong Kong, Sydney and London! ), the recipe was actually perfected by Lee Cheng Hoon(trading under the Tiger head brand) in Teluk Intan during the 1960s. Sin Joo Heng Tiger Head is still in operation, although it is overshadowed by its Ipoh counterpart. Otherwise known as dragon ball biscuits (or more accurately, dragon pearl biscuits), these sweet/savoury tidbits were created in Penang in the 1940s. In 1948, a Mr Seow Oh Thor founded the Him Heang biscuit company. It was Seow who created the original Tambun biscuit to have a product that wouldcompete with the biscuit industry giants of Penang, Ghee Hiang. The flaky pastry and fragrant golden brown filling of Him Heang’s biscuit soon won over a legion of fans. To this day, Him Heang is still a family-run business and all its biscuits are made by hand. The company does not have any agents or outlets anywhere else other than its flagship store at Burma Road, Penang. If you don’t get it from there, you can’t get it anywhere. 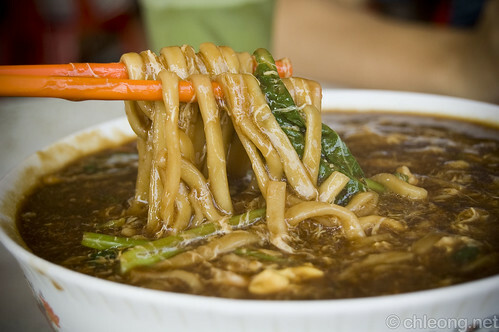 Lor mee is a unique dish of thick noodles served in a thick savoury and tangy gravy. The place most identified with Lor Mee is Ulu Yam, Selangor. That’s because Lor Mee is the creation of Ulu Yam’s very own Hock Choon Kee coffee shop. The humble kopitiam was started in the early 1900s, but Lor Mee was actually created around the 1950’s. The shop’s owner (who has another more interesting back story) was inspired to create the dish when he tasted a kind of thick soup and saw the potential of adapting it for a noodle dish. Hock Choon Kee kopitiam is still there in Ulu Yam, where it still serves its signature Lor Mee. Now run by the founder’s third-generation, the silky smooth noodles are still hand-made in small batches in the shop’s ancient kitchen several times a day. Lor Mee’s popularity has spread throughout Malaysia, but nothing beats the hearty goodness of the Ulu Yam original. 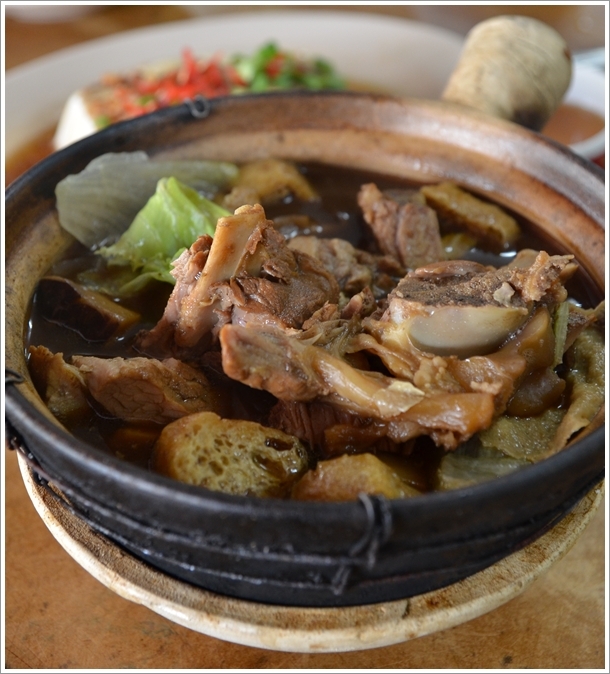 Bak Kut Teh is another well-loved Malaysian dish. It’s not just a dish, it’s an institution – with legions of fans swearing by it. Singapore even tried to claim credit for inventing it! But the fact is, this herbal soup dish is well-documented to have been developed in Malaya (specifically, Port Klang) during colonial times. The story goes that an enterprising hawker decided to add nutritional Chinese herbs to his pork bone soup (Bak Kut Th’ng) to help boost the hard labourers’ physical well-being. And so, “pork bone tea” (Bak Kut Teh) was created. Back then, it was mainly served to the Hokkien immigrant community, who worked as coolies in the docks. Life was very hard, so the coolies looked forward to Bak Kut Teh’s nutritional boost. Of course, the herbs gave the soup a real kick. There is one company who claims that its Bak Kut Teh origin story is “verified by history”. Their story follows the popular origin story closely, but mentions specific dates, places and persons. You can read about it here. This story has been verified by another source (read it here) who helpfully mentions that the 3rd generation of the original creator is still running a Bak Kut Teh place in Klang. Fried Hokkien Mee is a dish of thick yellow noodles braised in thick dark soy sauce with pork, squid, fish cake and cabbage, and sprinkled with deep fried pork lard. Today, Fried Hokkien Mee is a popular dish found everywhere in Malaysia, and is a staple of Dai Chow and Siu Chow restaurants. The most famous place to have it is Restoran Kim Lian Kee, Petaling Street, KL. Probably because they invented it! Kim Lian Kee was founded by Mr Ong Kim Lian over 80 years ago, making it one of the oldest and most historic restaurants in downtown KL. There are two Kim Lian Kee restaurants located at the crossroad of Petaling Street. The original stall (located opposite Hong Leong Bank) still serves traditional Hokkien Mee fried over a charcoal stove. These days, the Kim Lian Kee brand of Fried Hokkien Mee has moved upmarket, with several outlets located in upmarket shopping malls.